Staircase storage is an ingenious space-making solution that makes us wonder why it’s not a standard home feature like doors and windows. While it might someday become a household staple, you don't have to wait. The following nine ideas will show you how to put the unused square footage under your stairs to good use. We are huge fans of floor-to-ceiling storage options, so of course this impressive staircase created by Schemaa Architecture, caught our eye. The cabinets and a single bottom drawer make the most of every inch of under stair space. Tom and Shaye, the tiny home enthusiasts behind, DIY House Building, say their teeny house, which they call Lucy, wouldn't feel spacious if it wasn't for their storage staircase. They share how you can design a box step staircase like theirs that includes both cabinet and cubby storage here. This micro-loft in Prague utilizes the staircase to maximize kitchen space. Under the steps, you'll find cabinets and a few major appliances like a convection oven and wine refrigerator. Guillaume Dutilh and Jenna Spesard, the traveling duo who write for Tiny House Giant Journey created a staircase for their dog in their wee abode so the pup could join them in their loft space. It was constructed using around a dozen vintage wood crates, which they reinforced with nails and screws. While they know their crate steps aren't up to code, the couple uses it too. The Bay View Tiny House is a stick built home created by college students. It features a staircase that does double duty as an entryway closet. This super teeny micro apartment in Paris designed by Kitoko Studio has a bookcase staircase that leads to the loft bed. When the steps are not needed, they can be tucked inside the wall cabinet. A small NYC loft with double height ceilings transformed into a duplex thanks to this ship ladder staircase. Not only did these steps create an additional level of living space, but they also provide the home with more storage. If you're wondering what the heck are ship ladder steps, here's the deal. Stairs with alternating treads (like this one) are widely used in ships because they take up less space than conventional staircases. This one-of-a-kind staircase requires folks to step on its coordinating desk and shelves so they can climb the suspended stairs. 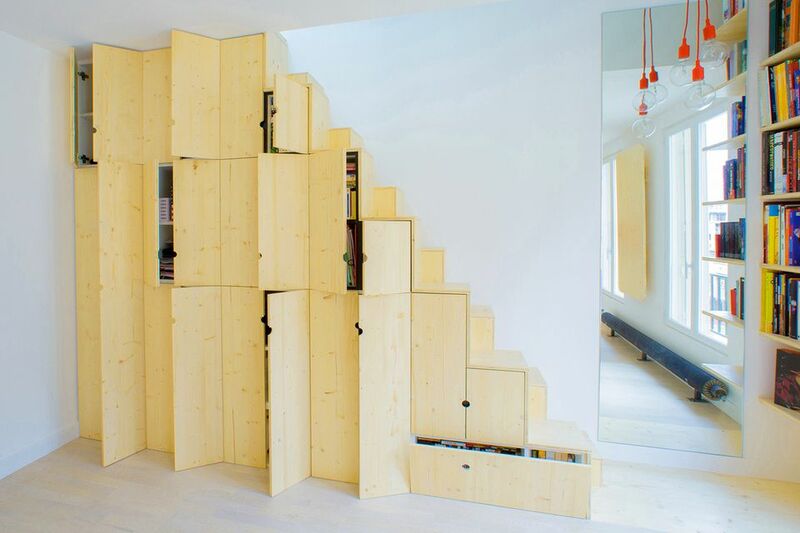 While it may not meet building codes here—it was designed for a home based in the Netherlands—it's still an inspirational staircase storage idea. Just add handrails! We spotted this super functional staircase on Tiny House Listings. Under its steps are four different kinds of storage. Five risers conceal dresser drawers while one reveals a small bookcase. The side of the staircase houses a clothing rack and a lower compartment for storage bins.